Bishop Moynihan tells crowd that Mother Marianne had the ability to see the image of Christ in everyone, including lepers. Bl. Mother Marianne Shrine in Utica. UTICA -- Secular Franciscans participated in the dedication of the Bl. Mother Marianne Cope Shrine at St. Joseph-St. Patrick Church on Oct. 3. 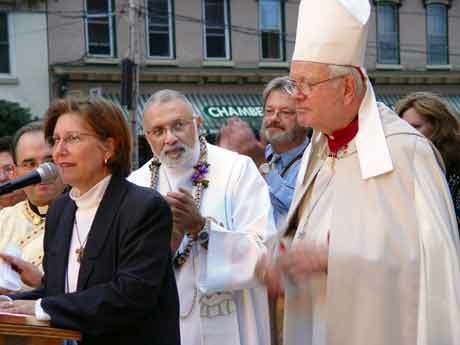 Betty Frank, SFO, was one of the organizers of the event, which featured Syracuse Bishop James M. Moynihan leading a crowd of about 750 people in Benediction of the Blessed Sacrament and in the blessing and dedication of the shrine. Nearly a year earlier, the words "Home of Mother Marianne Cope" could be seen painted on the lawn of St. Joseph-St. Patrick Church on All Saints Day 2006. 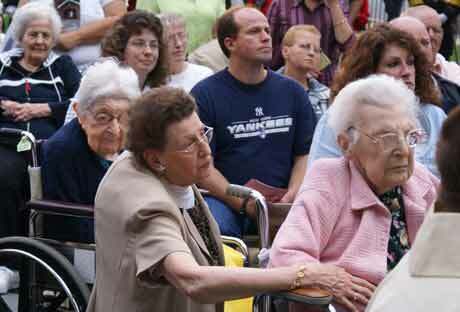 Mother Marianne's two great nieces, Helen and Marion Ruff, residents of St. Joseph Nursing Home, Utica, were among the crowd that watched a groundbreaking ceremony for a Shrine that would honor the Blessed Mother Marianne. A year-and-a-half earlier, she was beatified in St. Peter’s Basilica in Rome, Italy. Her great nieces returned for the dedication on Oct. 3, 2007. Betty Frank, SFO, with Mother Marianne's great nieces, Helen and Marion Ruff. Best known for three decades of caring for and educating leprosy victims in Molokai, Hawaii, Bl. Mother Marianne died in 1918 without ever returning to her hometown, Utica, or the mainland. Born Barbara Koob in Germany, her parents immigrated here when she was one-and-a-half to 2 years of age, and resided on Schuyler Street, in West Utica. She attended St. Joseph School and was one of the first parishioners of the church to become a Franciscan Sister. Just before the 2006 groundbreaking, a custom-made four-and-a-half-foot high sculpture of Mother Marianne arrived at the parish. The creator of the work, Bob Jackowski, is a retired Florida artist who worked for Disney World and the Franklin Mint. Sullivan Construction immediately began work on the Shrine that would face Columbia and Varick Streets. The structure was completed in mid-December, just in time to install the sculpture on Dec. 22 and welcome Mother Marianne home for Christmas, Parish Administrator Father Richard Dellos and Shrine Committee coordinator Betty Frank noted. Landscaping was completed over the summer of 2007, with the official dedication scheduled for Oct. 3, 2007, in cooperation with the Syracuse Diocese, so that Bishop Moynihan could be present to bless and dedicate the outdoor shrine. Father Dellos, Fr. Peter Ben Opara and Deacon Gil Nadeau participated in the ceremonies, along with a host of clergy from the surrounding area and even from other dioceses. Mary Stronach, SFO, with Fr. Richard Dellos and Bishop James Moynihan, thanks dignitaries, special guests, workers. After the dedication, Sr. Grace Ann Dillenschnieder, OSF, of the Sisters of St. Francis of Syracuse, presented a relic from Mother Marianne’s coffin to Father Dellos for the shrine, and a Franciscan sister from Hawaii placed a lei around Father’s neck. Then Mary Stronach, SFO, on behalf of the shrine committee and church, recognized dignitaries and special guests in the crowd, and offered thanks to the many people who helped make the shrine a reality. A special commemorative booklet about Mother Marianne and the shrine was handed out to all the attendees. The booklet was made possible and created by Betty Frank, SFO; Bob Stronach, SFO, and Mary Stronach, SFO, all members of St. Joseph Fraternity.